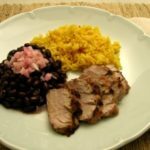 A quick and easy Cuban meal of grilled mojo criollo marinated pork tenderloins, black beans topped with marinated shallots, and yellow rice. In a container with a lid or zip-top bag, pour mojo marinade over the pork. Cover or seal and let marinate in the refrigerator for at least 4 hours. Take out of refrigerator 1 hour prior to cooking to get pork to room temperature. Grill or roast tenderloins until internal temperature is 145 degrees F. Loosely cover and let sit for 10 to 15 minutes. Slice and serve. Chop shallots (or onion) and place in a small bowl. Pour red wine vinegar to cover the shallots. Let marinate for at least an hour. Serve as a condiment to go on top of black beans. Heat black beans in a saucepan or in a bowl in the microwave. Warm the bread for a few minutes in the oven or according to package instructions. Serve it all up and enjoy!